Aluminium Centre plate for socket insert ref.-no. 3521 EINS. It will work in combination with any frame in the LS range. 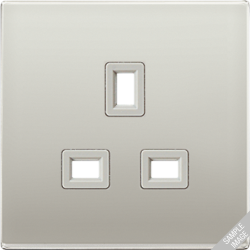 Aluminium Centre plate for socket BS 2521 EINS. It will work in combination with any colour of BS 2181. Are you looking for a different colour?